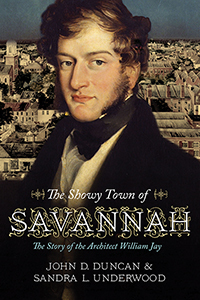 When William Jay, a professionally trained architect, arrived in Savannah from England, he was twenty-six years old--ambitious, precocious, and brilliant. By the time he departed in 1822, he had designed several magnificent mansions and remarkable public buildings. This story of Jay reveals how he found his way to Savannah and left a legacy of architectural significance. His work would prompt Savannah's enviable reputation of being one of America's most beautiful cities. As the steward of two of the most important surviving buildings by William Jay, the Telfair Mansion and the Owens-Thomas House, I welcome this new account of this gifted young architect. Each year over 200,000 visitors to Savannah tour these two remarkable National Historic Landmark buildings and see the ingenious details that define Jay’s work. Now they will have the opportunity to learn the whole of Jay’s fascinating story. Our knowledge of William Jay has long been skeletal. This book puts flesh on the bone and breathes new life into our understanding of one of the earliest architects to practice in this country. While highlighting the story of Jay in Savannah, this account provides vivid insight into the complex world of architectural training and patronage during the early nineteenth century against the backdrop of global trade, empire, evangelism, and slavery across three continents.